Divorce or other significant changes in a family affect children in ways parents do not often foresee. This seminar is designed to educate and assist parents in helping their children navigate successfully through the divorce process. Topics such as loss and grief; avoiding problems inherent in the divorcing process; effective ways to co-parent; how developmental stages may impact children’s reactions; and other relevant issues are addressed. There is ample time for parents to interact, ask questions, and participate fully in the seminar. The seminar satisfies Georgia and Alabama state requirements for divorcing parents with children under 18. In compliance with the court order, the classes must include a focus on developmental needs of children, emphasis on fostering a child’s emotional health during periods of stress, the grieving process, coping skills, co-parenting skills, financial obligations of parents, successfully navigating the legal system, and a small section on how now single parents can move forward in connecting with another romantic partner at some future date. The seminar also accommodates parents seeking legitimation and resolution of custody changes. Parents may voluntarily attend. 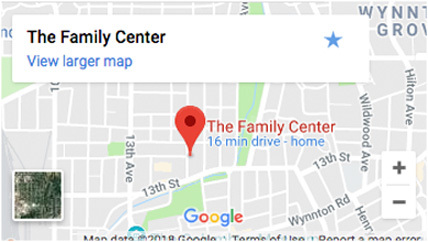 Seminars are held once a month on the fourth Thursday from 5:00 p.m.-9:00 p.m., at 1350 15th Avenue, Columbus, GA, at The Family Center of Columbus office. Check-in is at 4:30 p.m. Late arrivals are not admitted and children are not allowed to attend. Beginning July 2018, the cost is $40.00 per person. Couples may attend together, if desired. Registration Information: Parents must register before attending, as seminar class size is limited. Please call 706-327-3238 to register. Please bring case filing number to the seminar.